ão Paulo´s Municipal Theatre was built in the new part of the city, until then sparserly inhabited, and came to be a centre of attraction for development of the region. It faces a square, the Praça Ramos de Azevedo, and stands above the valley of the Anhangabaú river - a privileged position in São Paulo's urban landscape. 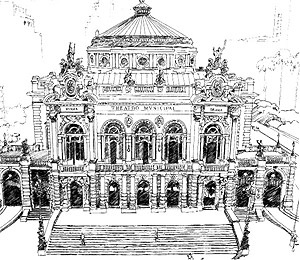 According to architect Carlos Lemos the design was by Claudio Rossi, with the help of Domiziano Rossi, from the office of architect Ramos de Azevedo; like the Municipal Theatre of Rio de Janeiro, built at the same time, it was inspired by the Paris Opera. Eclectic in style, the Theatre is heavily loaded with ornament, so as to achieve accentuated effects of light and shade, in this it resembles the Rio Theatre, though it is less luxurious inside. The façade with it lateral pavilions, the broad front steps, the building material in various colors - these are closer to Paris than to Brazil's former Federal Capital. The façade is distinguished by pairs of vigorous atlantids which support first-floor balconies, and by columns of polished syenite with bronze capitals on the same floor. The pavilions set on either side of the façade are crowned with groups of sculptures representing Drama and Music, also in imitation of the statuary of Garnier's Paris Opera.